The Boston Globe announced this week that its Newspaper In Education program will provide Apple iPads with digital subscriptions to the publication in Massachusetts public schools. The newspaper's pilot program will use $65,000 of vacation donation funds from Globe subscribers to buy 75 iPads and projectors. A total of 50 of those will go to Boston Public Schools, while the remaining 25 will be provided to Stoneham High School. Each of the iPads will come paired with a digital subscription to BostonGlobe.com, and teachers will also be given an onsite tutorial in how to integrate Apple's tablet into their classroom. The Boston Globe plans to run the program through the spring semester, after which it will be evaluated through teacher focus groups. "We believe that digital kids turn into digital adults, to put it simply," said Robert Saurer, director of customer experience and innovation at the Boston paper. "We want to provide easy, portable access not only to our content, but to the greater world of content on the Web  deployed in the classroom daily, streamed live, as the kids are learning." The Newspaper In Education program has historically mixed print and digital subscriptions provided through subscriber vacation donations. But the NIE program has been looking for new digital opportunities as the costs for paper, ink and distribution have risen. "In the past, we have had to rely on the limited number of desktops or laptops available in schools," Saurer said. "Computers are often not available for social sciences classes, or for other work where students would benefit by being able to do their own online research." 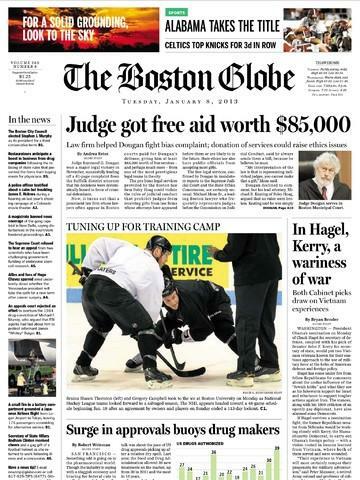 The Boston Globe has a full replica edition of its daily paper available on Apple's iOS Newsstand for iPad and iPhone. New editions of the publication are automatically delivered to a user's device every day at 6 a.m.